When the former British colony of Singapore became a country nearly 50 years ago, its people were sustained by a multiethnic street food culture that would make the island-nation a global food mecca. This was long before the arrival of celebrity chefs, Michelin-starred restaurants, eye-popping restaurant tabs, and the rise of Singapore as one of most expensive places in the world to live. Back in the day, food hawkers generally had just one specialty dish, usually served from a rickshaw on the street — often on “opeh,” or banana leaves instead of paper plates. In the 1970s and ’80s, prompted by concerns over sanitation and unlicensed food sellers, Singapore moved street food vendors off the streets and into open-air pavilions called hawker centers, with running water and electricity. Hawker centers thrived, but today Singapore’s venerable street food culture is threatened by its growing wealth and changing tastes. As elderly hawkers hang up their woks, there are far fewer young people willing to carry on the tradition. Nor would many status-conscious Singaporean parents want them to. Lucky food hawkers have children who help out like Brendon Yip, who works for an IT firm during the week but spends weekends ladling out silky smooth Cantonese-style porridge at his parent’s Hwa Yuen Porridge stall at the Tiong Bahru hawker center. The 27-year-old doesn’t plan on taking over when his parents, now in their 60s, decide to retire. Nor do his two brothers, who also have corporate jobs. “No one knows what’s going to happen,” he says. Foodies, bargain lovers, and even the Singaporean government worry about the fate of humble yet beloved artisanal and traditional foods. Efforts, including a government pilot program, are underway to preserve the endangered street food culture. Singaporeans take their food extremely seriously. Demanding palates and a wide variety of dishes make eating one of two national pastimes (the other is shopping). The food selection reflects Singapore’s cultural and ethnic mix of Chinese, Malays, South Indians, and Peranakans (descendants from British Malaya of Chinese, European, and Malay families). A well-prepared and satisfying meal from a food hawker can cost as little as S$3 (or US$2.22). The fear is that traditional street fare will become pricier — and grow out of fashion — in a city that is frequently named the world’s most expensive to live in. As traditional street food hawkers retire and the availability of good, cheap food becomes a concern, chain franchises and fast-food outlets continue to grow. There are increasingly ubiquitous indoor food courts, which have “air-con,” as it is called in Singapore, along with a new mix of available options including Western food outlets such as McDonald’s and Subway, as well as pricier options that are increasingly affordable to wealthy Singaporeans. Meanwhile, Singapore’s growing wealth has summoned the arrival of restaurants branded by celebrity chefs such as Wolfgang Puck and Mario Batali. The implications are economic, and not just for moderate-income Singaporeans who rely on the easy availability of cheap, good food. Food tourism is a big draw in this widely acknowledged food paradise, with organized food trails offering deep-pocketed tourists a glimpse into Singapore’s rich cultural history and diversity. Singaporean street food can mean many things to many people. It can mean chicken rice, a deceptively simple dish of plump and tender chicken served on a bed of rice made moist and fragrant with broth and ginger. Or carrot cake, a fried radish cake. Or “popiah,” spring rolls filled with finely grated fresh vegetables. Other basic hawker fare includes “laksa” (a spicy noodle soup combining Chinese and Malay elements), “bak kut teh” (a peppery pork rib soup), and “rojak” (a fruit and vegetable mix that is part of a Javanese ceremony for first-pregnancies). More unusual dishes include black-skinned chicken (believed to have medicinal qualities), pig organ soup, fish head curry, and frog leg porridge. On the somewhat pricier side of hawker fare are chili crab, black pepper crab, and barbecued stingray. Food blogger Leslie Tay, author of “The End of Char Kway Teow and Other Hawker Mysteries,” says hawker center prices are too low to draw enough young people into the hawker profession. He also sees the tradition of highly skilled hawkers specializing in a single dish — such as “char kway teow,” a popular noodle stir-fry — giving way to a trend toward mass-produced fare and today’s wider choice of international foods. Hawker center food prices are slowly creeping upward. A survey released last fall by the Consumers Association of Singapore found that hawker food prices increased by 10 to 20 percent for most food items over a two-year period. Preserving Singapore’s hawker heritage is the goal of a recent government program that pairs up young apprentices with experienced hawkers. But the take-up has been low. 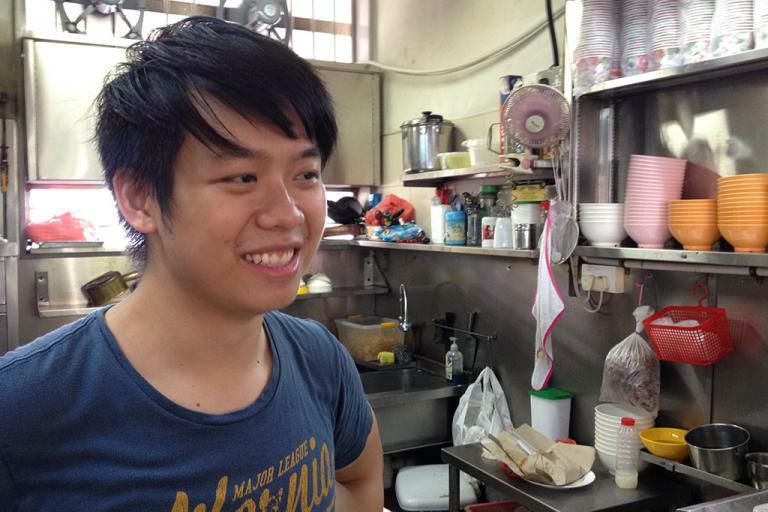 Wayne Tan, 28, who serves the Chinese Hakka dish thunder tea rice, is doubtful about efforts to attract fellow young hawkers.